Although Fedor Emelianenko hasn’t lost a fight in nearly 10 years, Strikeforce heavyweight champ Alistair Overeem believes he will be the one that ultimately takes MMA’s Terminator down. “I surround myself with people who have the same attitude, intelligent people which you can learn from and develop yourself. In the gym my sparring partners don’t really like me,” Overeem told Sherdog.com. “There’s nobody else out there with the speed, technical ability and the sharpness [to beat Fedor]. After steamrolling Brett Rogers in a tune-up fight over the weekend, Overeem immediately called for a shot at Fedor – while taking a slight dig at the Russian’s manhood in the process. 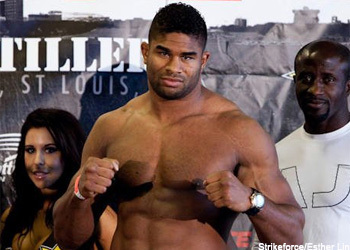 “His management declined for him to fight me [at “Strikeforce: Heavy Artillery”],” Overeem emphatically stated. “Respect for Brett, because he stood up and he wanted to fight me like a man. Those are some pretty bold statements for Overeem to make, especially when you take into account Emelianenko holds a dominant 31-1 professional record and has been perfect through his last 27 scraps. However, he made them – once again – and he isn’t backing down. Emelianenko will headline Strikeforce’s June 26th event against Fabricio Werdum. It has been heavily rumored that if he is able to leave the HP Pavilion in San Jose, California victorious and unscathed, Overeem and Fedor could star in the organization’s first pay-per-view broadcast later this year.